Last nigh, during the last show of Let's Talk Geek, Jan mentioned an online storage cloud service that was different. Different in the sense this one does not have to synchronise to your local machine to be usable, it can live in the cloud and becomes a drive letter our mount. Bitcasa installs on Windows 8.1 as a tray icon application, but then you have a new drive letter in My Computer which is the online storage. You can then decide what to sync locally, but at least the online files can be opened directly by normal software. But the deal breaker is mirror any folder anywhere into Bitcasa. 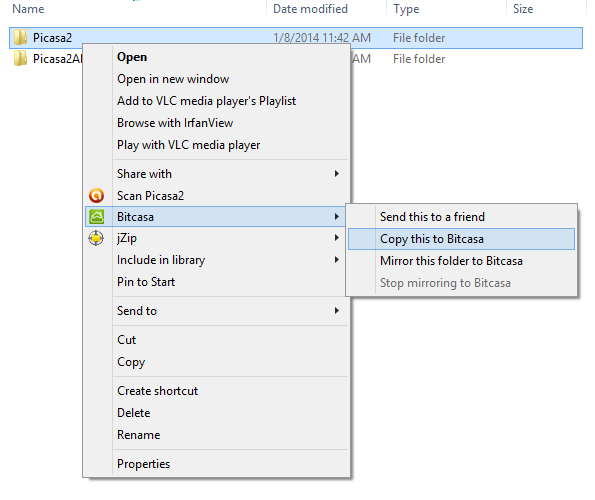 Simply right click and Bitcasa is part of the extended options and you can select to mirror that folder. The mirror option is not available for network shares, however you can still "Copy this to Bitcasa" which makes a cache copy on your machine, and then copies the files into Bitcasa. The free account starts on 5Gb, and installing the desktop and mobile applications gets you another 1Gb. A very slick website and native applications for Apple and Windows, makes this definitely something to give a try.